All too often, data center users enter new markets and are greeted with unpleasant surprises on their energy spending. For those who are considering acquiring data center space in deregulated markets, including Chicago, the Mid-Atlantic and Texas, this report is intended to drive transparency and uncover cost drivers that will impact your energy spend. 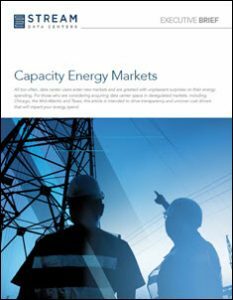 In deregulated U.S. energy markets, there are two prevailing market structures — energy-only markets that charge customers solely on their energy use, and capacity markets that incorporate fees to pay energy producers for their ability to provide reserve capacity to meet peak demand. And with the recent shutdown of a significant amount of coal-fired capacity in Texas, along with the latest wave of blizzard conditions in the Northeast, it’s important for commercial customers to understand potential pricing pitfalls as volatility pushes rates upward in both markets. Download the new white paper from Stream Data Centers that covers the ins and outs of capacity energy markets for data centers, as well as the most practical ways to address your data center and colocation energy needs.